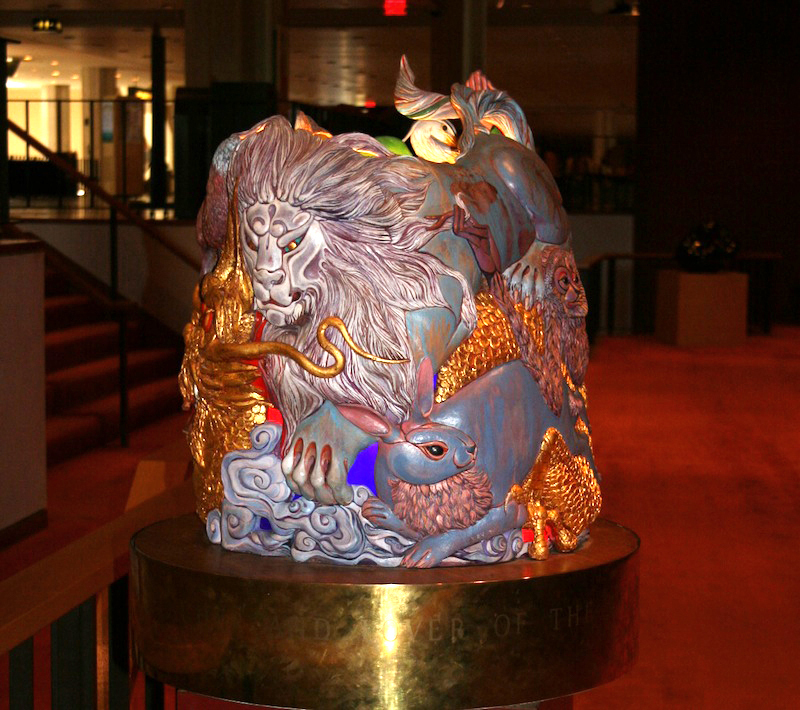 Artist Harry Breen (1930- ) created this sculpture–a terracotta group with gold leaf, acrylic paint, and stained glass. 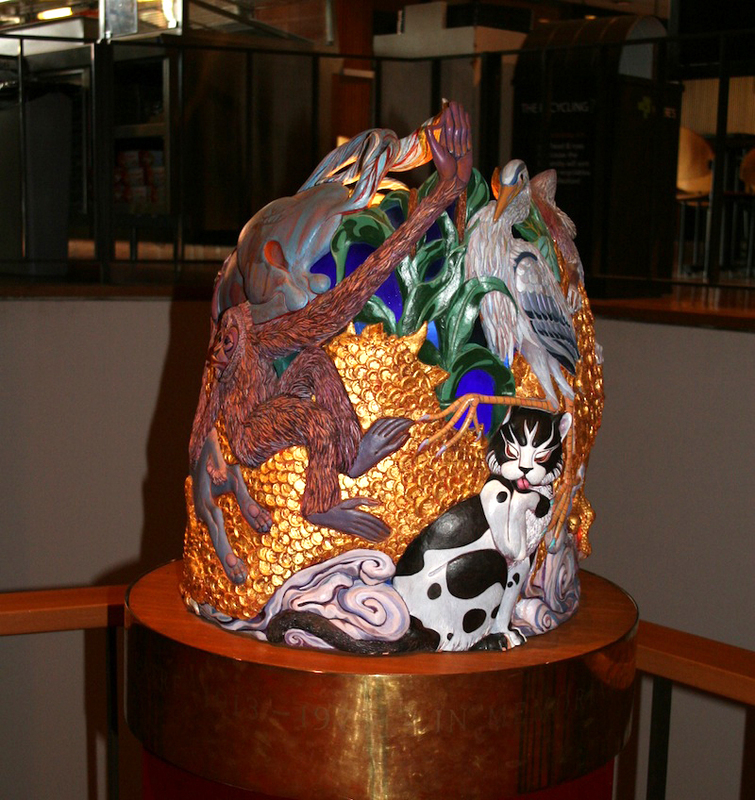 The piece of art stands at 26" high in the Colwell Theatre lobby of Krannert Center for the Performing Arts. 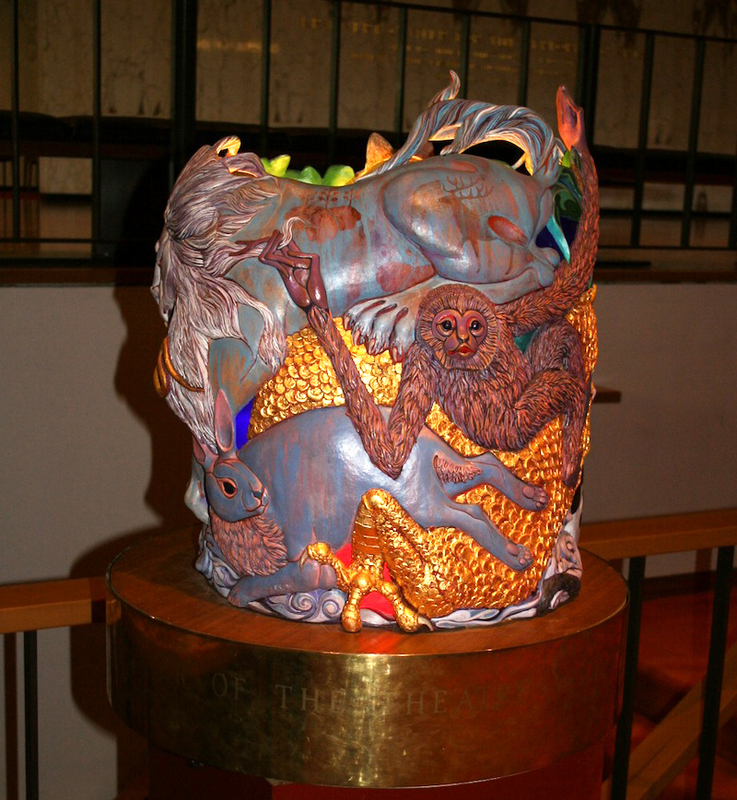 Harry Breen's vividly colored ceramic sculpture at the entrance to the Colwell Theatre honors Joseph Wright Scott, a respected member of the Department of Speech and Theatre from 1936 until his retirement in 1972. lnscribed on the base are the words, "In memoriam-Joseph Wright Scott-teacher and lover of the theatre 1913-1975." Scott's doctoral dissertation dealt with traditional Japanese Noh theater, which derives from folk mythology and religious sources. Since Noh actors frequently perform as animals or birds, the artist chose seven beasts that are typically portrayed. He clustered them in a drum form much like horizontal scrolls that unroll and mounted them on a pedestal that electrically rotates at a speed of one tum per minute. Represented are a cat (white with blue spots), a rabbit (blue), a monkey (hairy and dark), a fox (orange with blue and purple overtones), a heron (gray-white with touches of lavender), a lion (blue and white, with a stag symbolic of the Scott family crest painted on its body), and a dragon (a not very ferocious creature heavily encrusted with gold-leaf scales, the inside of its red-orange stained-glass mouth seeming to "jump out," in the words of its creator). Breen said he wanted to convey the richness of a stage presentation, creating effects that suggest brocades, hair, paint, "a highly tactile surface consisting of flat color areas contrasted with thickly roughened textures in various patterns." 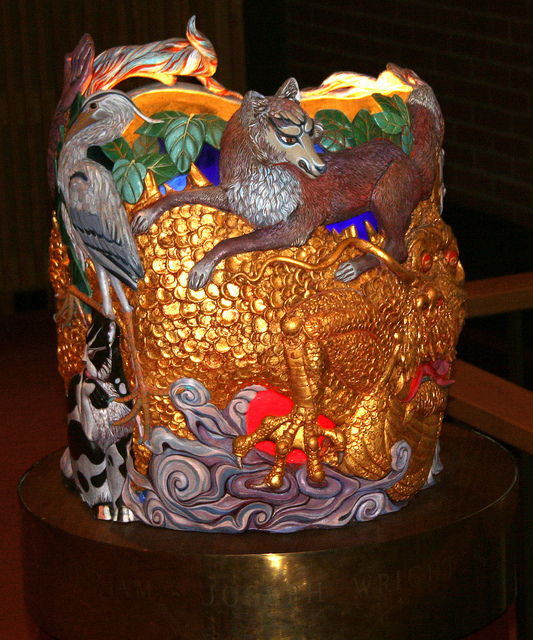 Color-polymeracrylic paint laid on terra-cotta after firing is used as it appears in Kabuki theater, especially in the juxtaposition of iridescent and strong rather than low-keyed hues. The application of abundant beaten gold leaf allows light to bounce off the piece, giving it drama and focus. Light also comes into play with the stained glass, predominantly in reds and blues, that glows between plant leaves, behind the dragon's claws, and in the beast's pierced eye, where light from within shines through. 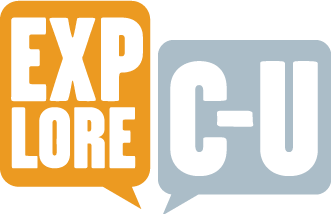 According to the artist, the play of negative space becomes a visual and formal element. Symbolic components play a part, too. Exaggerated spiraling wave forms signify clouds, a motif taken from Japanese art. The massed leaves of soybeans and corn plants allude to Scott's central Illinois heritage. His grandfather, James Robinson Scott, served as a very early member of the university board of trustees and later as mayor of Champaign. A painter as well as sculptor, Harry Breen was a professor of art at the university from 1959 until his retirement in 1985. His work includes Illinois Prairie/October Fields I, a painted relief mural for the First Savings and Trust Bank, Taylorville, Illinois; large mixed-media murals for Holy Cross Church, Champaign, and for Covenant Hospital, Urbana; and the Thomas A. Read Memorial Plaque in the University's Mining and Metallurgy Building. Muriel Scheinman, “Joesph Wright Scott Memorial, 1979,” ExploreCU, accessed April 21, 2019, https://explorecu.org/items/show/36.